Two metal masterminds celebrate their heritage, end up with tasteful new project that reaches far beyond the realms of metal. Written by Enslaved’s Ivar Bjørnson and Einar Selvik of Wardruna, for the 200th anniversary of the Norwegian Constitution, Skuggsjá is the history of Norway from the beginning to present day. The music highlights the country’s Norse heritage via the use of folk instrumentation and celebrates the traditions and intellectual concepts of the nation. There is a blend of proto-Scandinavian, Norse and Norwegian in the lyrics that tell this unique story. So, how is it, then? The record opens with “Ull Kjem”, seven minutes of moody, mysterious music that builds to a climax that blends those elements of the old and new in a release that provides pure catharsis for the listener. It is a ravaging of the ear drums, a kicking of the aural tuchas and reflection of pure Northern ingenuity. 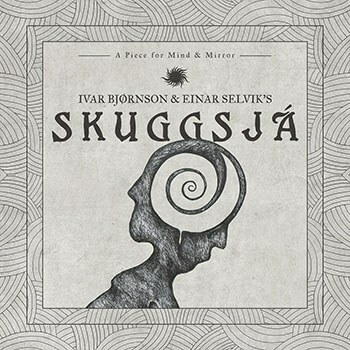 The 10-minute-plus title tune which follows takes us on a similar musical and emotional trajectory, but lays waste to the expectations that this a mere fusing of Enslaved and Wardruna, that this is anything less than pure alchemical magic captured in these measures and explorations that somehow encapsulate the ages in this vessel of sonic majesty and mastery. But it is the blending of the new and the old music of the nation that is one of the most intriguing parts of this story and those blends can perhaps best be heard on “Makta Og Vanæra. For All Tid", with its superb vocal layers and impenetrable bed of heavy, heavy guitars. Elsewhere, “Tor Hund” brings together the past and present but also, sonically at least, casts us into the future with sonic architecture that seems cribbed from some future, superior civilization where music is more expressive than even in our own time. Those seeking their pure metal fix, though, only need to hear “Rop Fra Røynda - Mælt Fra Minne”, which so seamlessly blends tradition with the groundbreaking that a new hope for these kinds of collaborations is forged.